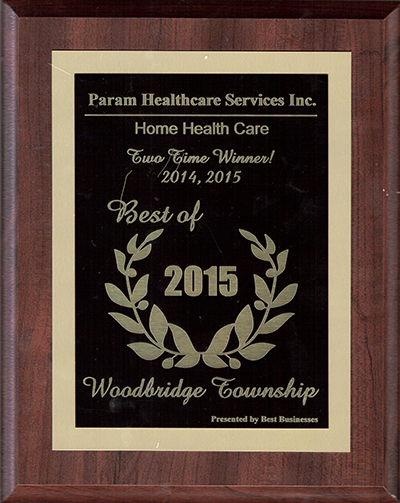 The team of Param Healthcare Services, Inc. is proud to share with you that we have won The Best Home Healthcare Agency Award this year as well presented by Wood bridge Township. As you have already discovered, for time to time we at Param Healthcare Services, Inc. believe in providing service with humanity, trust and love. Although We put in efforts to give our clients the comfort he/she would seek while taking care from our employee. Many times, families or individuals find it difficult to maneuver everyday life. Moreover Caregivers provide a functional way to aid those in need of extra care. Finding the right caregiver to provide all the exact needs can sometimes be a problem. Lastly to help protect satisfaction, Param Healthcare Services strives to match clients need. Our mission is to promote health and finest care in a comfort of home environment. We know the value of every person and Param always stands for client’s choices, Individuality, Privacy, Independence and Dignity. To join Param Healthcare means adding years to your life and Adding life to your years. We are honored to be recognized by Wood bridge Township for Two consecutive years 2014 & 2015 as Best Home Healthcare Agency. The truth is we are always trying to satisfy you whether you use our services for a day or years to come. We want your experience to be so positive that you will happily recommend us to your family & friends.